Photo courtesy of CSU Chervelle Cox (35) led Central State with 14 points and 10 rebounds in a Nov. 20 road loss to nationally ranked California-Pennsylvania. 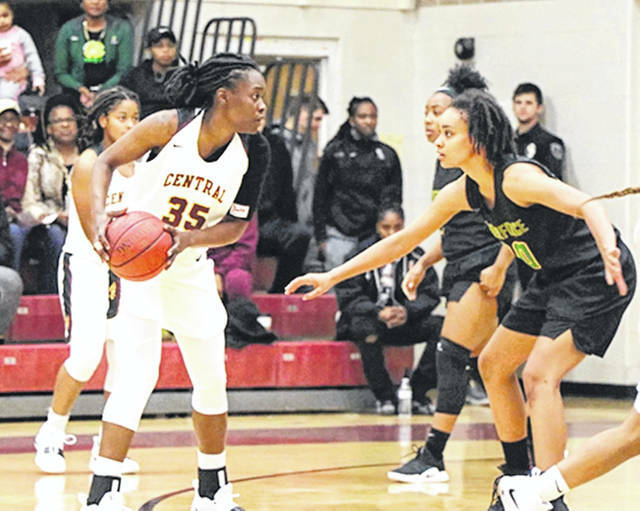 CALIFORNIA, Pa. — The Central State University women’s basketball team lost its third straight game on Nov. 20 falling to California University of Pennsylvania, 75-62. The loss drops the Marauders to 2-3 overall while the 25th ranked Cal-Penn Vulcans improve to 4-0 on the season. The Marauders began the night on a high note, building a 20-8 lead in the first quarter and taking a nine-point lead into the second period. Cal-Penn cut the deficit down to one with an 11-2 run midway through the second frame and took its first lead, 34-33, on a Jiahna Flood-Francis basket with 1:07 left in the half. A jumper by Seairra Barrett with five seconds left gave the Vulcans a 38-35 lead at the break. CSU struggled to find its mark in the third quarter, managing just eight points while committing nine turnovers. While the Marauders struggled offensively, the Vulcans built their lead up to 13, taking a 56-43 advantage into the fourth quarter. Cal-Penn took its largest lead of the night, 65-47, on a Barrett basket with 7:48 to play. CSU cut the lead down to 11 after a Takyra Gilbert three-pointer with 3:48 left but that was a close as the Marauders would get as Cal-Penn coasted to the 13-point victory. CSU committed a season-high 27 turnovers, nullifying an efficient 54.3 percent shooting performance on the night. Barrett led all scorers with 28 points. Flood-Francis added 15 points. CSU was paced by Chervelle Cox’s 14 points and 10 rebounds. Jaeda Davis tallied 13 points while Brooke Spaulding added 11 points. Gilbert, CSU’s leading scorer, was held to a season-low seven points. The Marauders will begin Southern Intercollegiate Athletic Conference play Saturday, Nov. 24 at Albany State University in Albany, Ga.
https://www.fairborndailyherald.com/wp-content/uploads/sites/50/2018/11/web1_CSUwomen.jpgPhoto courtesy of CSU Chervelle Cox (35) led Central State with 14 points and 10 rebounds in a Nov. 20 road loss to nationally ranked California-Pennsylvania.